With Google’s new Correlate system, companies have a powerful (and, free!) new data-mining tool on their hands. Let us imagine the ways in which we’ll use it. You can use Google’s algorithms to mine almost any kind of search data, the simplest being how your brand is searched for compared with your peers (though you’ll have to figure out the “why” on your own). After logging in, you can upload any data and leverage Google’s huge search history and algorithms to see if there’s a correlation over time. Brand managers keen to see if their promotional TV ad campaigns result in echoed online activity searching for their brands (and possibly compared to their competition) can do so with a few clicks. Publishing houses can see whether readers are searching for their magazine, or their online entity. Economists and sociologists pondering if searches for “credit card” and “no interest credit card” decline proportionally to a recovering economy now have a powerful data ally (spoiler: yes, that correlation is true). You don’t even have to produce an analysis on time-series data, as the tool lets you do a scatter plot to compare search trends between different data. If you want to see how particular search phrases trend, Google will suggest similar search parameters for you (courtesy of its vast and complex data archive) for comparison. Academics, marketers, and a bunch of other industries are going to go crazy over this. And Google will benefit, by having its brand promoted and (possibly) by collecting and correlating even more data about…data and correlations. So how did Correlate come to be? 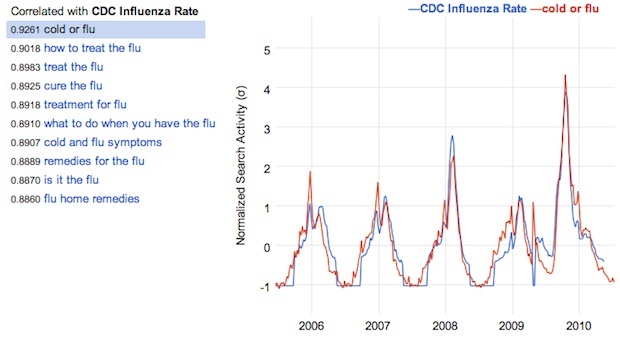 Announcing the news on its blog, Google noted that the new service is a product of the flu epidemics of 2008–when the search firm found that “activity of certain search terms are good indicators of actual flu activity” and launched the Flu Trends warning system based on the statistics. Since then, many other bodies, including Google’s own team, have realized that there’s the possibility to model real-world data based on patterns in how millions of people type in search words…a correlation between real-world events and the search world, in effect. Google’s existing tools weren’t quite up to the job, so it created Correlate. As simple as it seems, this is an extraordinarily powerful tool. In its announcement, Google tried to keep the tone light, noting that cell biology isn’t “too popular in the summertime.” Joke all you want, Google, but the usefulness of this new service isn’t lost on us.